Showing results for tags 'lump'. I just got a 26 inch Weber kettle for Father's day. Since I have been using my Kamado for the last year, I love using lump charcoal. Is there any benefit to using lump in a kettle? I read an article on the Weber site and it said lump cooks fast on a kettle grill. Hopefully my peeps here can give me some insight. Lump charcoal use on kettle please give me your thoughts. I know Cowboy Lump gets mixed reviews but for $0.50/lb shipped to my door I'm probably going to give it a shot. Cowboy® 20 lb Hardwood Lump Charcoal $9.78 Order 4 bags and they'll ship for free. I've used a lot of RO but haven't been able to find any decent deals around me in the past 6 months. I've been using El Diablo lately and AFAIC it is decent stuff. Local walmart stores have had 40# bags for $15 but it has started to be hard to find. I finally found a Costco brisket up to my specs, so I going to see whether I can discern the difference between a choice packer and a prime. Granted, it would be best if they came from the same meat packer but, still... With all the talk of upcoming changes for the KJ in 2018, addressing idiot proof ease of lighting and temp control, I am wondering how many of those owners would be willing to be out in thirty plus degree weather at 2am to get one of these big boys started... She didn't require much trimming so, I definitely lost less than a pound and a half and I think I am grossly overstating that... Now with the rub. On second thought I need to add at least as much black pepper again in order to approach a proper Louie Mueller bark. I'll add it during the cook after the butcher paper. But, put here into back into the fridge to 'dry brine' on Wednesday. 1:45 and Big Joe is sluggish to come up to temp... shooting for 215° - 225°. Tomorrow, I'm having about twenty-seven people come over for our 'Poke Chop Fellowship'. Twenty-four are having the 1.125" thick, reverse-seared center cut pork chops– I call these the pig porterhouse. 1st 17 center cut bone-in pork chops– seasoned (salt, pepper and a little chilli), sitting in all that lemony goodness and ready to go... awaiting final coffee rub. Last seven bagged up and redt2go... This part of the cook I have a plan for. I'm certain I have enough grill space between the divide & conquer system and a 22.5" extension grate so, I'll start off the morning and put a light smoke on (27) sweet potatoes. I'll cook them about half way through and put them in the oven to finish on low heat. Next, I'm going to put a 90 minute pecan smoke on the chops at or around 200°– put them in a cooler while I remove the deflector plates and crank the Big Joe up to about 400° and then reverse sear them twelve at a time. While the first twelve are in their ten minute rest, I have more than enough time to get the last twelve seared. My one dangling participle is for the vegetarians. How I can get some smoke on their steelhead trout and get them done around the same time. Hmmm, any suggestions? Hello, new to the forum, I was in Restaurant Depot and saw 20# bags of Laredo lump for $9.99. Anyone familiar with it? Started the Big Joe @ 11:00pm in slight rain. Used Kamado Joe Lump and pecan chunks. Temp settled in at about 245°. Started the Brisket 13# brisket at 12:10am. Adjusted the vents to @ about 2:10am to get the down to about 215° so I could grab some sleep. Woke up @ 7:10am, Big Joe temp was @ 200°- kicked it back up to 245°. Brisket was in the stall. At 8:20am. I started to worry about getting it off in time to start the turkey so, I set the temp to 285° and wrapped in butcher paper. Pulled it at about 9:35am with temp at 200° and probing tender in the flat- set aside to rest. Seasoned turkey with dry rub and butterflied it on Tuesday. Left sitting on tray in fridge. Kicked the temp up to about 305° and put the 23# turkey on- butterflied for an easy peasy even cook. sacrificed the presentation- we're eating at 1pm- won't be a whole lot of looking. Thought I would bring back a little fun from days gone by. Using a 19" KK table top model and Royal Oak lump I want to see how many cooks I can do without stirring the old lump before it clogs up and causes temperature problems. Started by cleaning out the KK and opening a new 17 lb bag of RO. I filled the firebox by dumping straight from the bag. Each subsequent cook I'll take a peak at the leftover lump and WITHOUT stirring it just top it off by dumping straight from the bag. I think I'll be able to go through at least 2 x 17 lb bags of RO before running into issues. We shall find out. Here is cook number 1. Here is cook number 2 with the lump leftover from the previous cook. Here is cook number 3 with the leftover lump from the previous cook. Check back often to see where this experiment goes. I'm beginning to understand a little more about this kamado cooking on the classic and so far I'm really jazzed, I like it. I'd like to get your opinion on charcoal. I've got a birthday party coming up Monday and will be cooking three chickens -- probably roasting them with a Puerto Rican spice, for a family get together. The pressure is on, its my wife's family, and I want this to be tasty! So far, I've tried two kinds of charcoal, the first was Royal Oak from Home Depot and then I got a bag of Cowboy at WalMart. I did a roast chicken with the RO and it was perfect, just a hint of smoke flavor -- but I was running out of charcoal in the firebox and pulled it at 161 degrees, thinking it would it would come up a couple degrees as it sat. Next time I'll wait until 165 Then I tried beer can chicken with the Cowboy charcoal and 1 chuck of applewood. The smoke flavor was too strong and although the chicken was pretty good when I first pulled it off, left-overs had a strong smoke taste. Its possible I didn't have the cowboy charcoal burned enough and there was too much smoke, but it was at the right temperature. Last night I cooked a London Broil, making sure the fire was hot and there was very little smoke coming out the chimney (450 degrees). The steak came out great, but the smoke flavor was a little strong and since I didn't add any wood for flavor, I'm convinced this is from the charcoal. Cowboy lump is probably made from Mesquite since it comes from Texas/Mexico and it seemed there were some 'branches' in the bag. Mesquite is great for grilling steak, but I've always thought it was too bitter for smoked meats. Years ago a guy from Texas told me it was fine for brisket, ribs or pork butts as long as you brined it or sprayed the meat with some kind of citrus juice during the cook. I know there are a lot of people who like Cowboy lump, but from here on out, I'm probably going to scratch it from my list. But, maybe I'm missing something here, and there's a way to get a milder flavor from the Cowboy lump. Cooking with Wood not Lump in a Kamado? 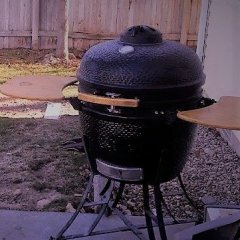 I have a buddy who is considering a switch to a Kamado (guess what sparked that ) from an Old Smokey (i think). Initially I thought I had him sold on a KJ and but it seems extremism runs in my circle and he's gung ho on a Komodo Kamado. I figured who am I to stand in the way of someone buying a Komodo but he's talking about cooking with wood in the Kamado and not lump. He asked me if it would work and I said I think it would but wasn't sure. I know we constantly have the charcoal vs. lump debates which is educational for me but rarely does wood come into the conversation. 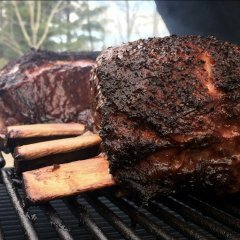 Is there anything wrong with using wood vs. lump charcoal? Pros/Cons? I'd hate for him to make the investment and be disappointed if his heart is set on cooking with wood. Thoughts? Bought a bag of the brown and red Kamado Joe brand lump. I must say the pieces are gigantic compared to the royal oak I have been using. Hardly any small pieces in the bag. Should I buy another bag of royal oak to get some smaller pieces? It burned great on my first cook with it. Took a little longer to get going. Any opinions are appreciated. Bayou Classic Lump Charcoal ... Overpriced at Free! 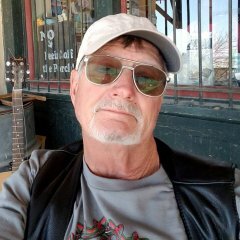 Smoke 'n Fire, a local Kansas City area BBQ supply store, is currently running a coupon promotion offering a bag of lump charcoal free with any purchase. This is what they are offering: http://www.amazon.com/Bayou-Classic-18-Pound-Natural-Charcoal/dp/B005MHD9HW I just used it to grill some steaks on my K.J. Even after giving it 15 minutes with the top open and then 25 minutes top closed to burn down to no visible smoke, it was sparky, snappy, and infused the steaks with a funky, off, unpleasant smoky flavor. My recommendation is that you steer well away from this product. Wholesale source for Frontier USA made lump in Illinois..
Well I was struggling to find Royal Oak for the first time and bought a small bag of this to try.. Cowboy is a no no for me.. Opened the bag and looks like nice med size pieces, anyone tried this in a kamado.. How was it as far flavor, heat and taste.. Thanks. Amazon Canada is no longer shipping lump. For some reason in Canada, we have lump labeled as a hazardous material. They ship thermocells and lighter containing butane. They various items with highly farmable alcohol. How in the heck did Lump Charcoal make the top of that list? My local Harps grocery store has 10 lb bags of Ozark Lump Charcoal for $5.54 (give or take). I don't have any experience with this lump but thought I'd pass it along. Finished a Venison roast (actually a cut of the hind sirloin). The meat was from a mature buck I took with a croossbow back in October before the rut. Medium sized fire brought to @ 275 and parked, cooked low for nearly three hours. Did not use thermometer just went by feel and sight. Let marinade about four hours, delicious. Hey guys, my Kamado Joe Classic should be in late next week or early the following week! Before it gets here, I would like to pick up some lump charcoal. However, what are some of your go to charcoals for low & slow and for higher temp searing & baking? Any particular good lower/moderately priced options? I have the same questions regarding wood to use for smoking as well. Also, what would be some good, cheap stuff to learn to control temps with? Thanks!